IDW Games and 20th Century Fox Consumer Products will release the storytelling party game X-Files: Conspiracy Theory in March. 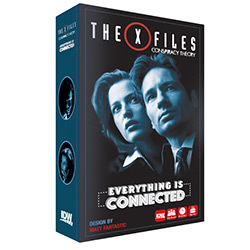 Designed by Matt Fantastic (Dirk Gently�s Holistic Detective Agency) X-Files: Conspiracy Theory is the second game to release in Fantastic�s Everything is Connected series (see �Solve Mysteries the Holistic Way�). Players take turns in the role of Special Agent Fox Mulder, who is trying to earn the respect of the other players (who are FBI Directors), by presenting a plausible theory that matches the evidence at the scene. The game takes scenarios from the X-Files episodes and puts players right in the middle. There is also a second game mode, based on the episode �Jose Chung�s From Outer Space.� Most players act as witnesses to a paranormal event, while one player takes the role of Jose Chung who must create a complete narrative that ties everyone�s stories together. The game is for 3 � 8 players, ages 16 and up, and plays in 20 � 60 minutes. MSRP is $29.95. IDW Games released another X-Files game in 2015 (see �Review: 'The X-Files' Board Game�).